Drink up, life's worth it! That's the slogan behind Green Brothers Juice. Granted you can take that to mean to drink anything liquid... like coffee, champagne, protein shakes, water, milkshakes or whatever you want really. But, we're talking about fruits and veggies here people, so that's where I'm going with this. And no, their last name isn't Green, I asked! The Green Brothers are all about making you feel your best. When you are healthy, you feel better about yourself and are more positive about life in general. The more you take care of yourself, the more things in life work out. It's just about giving your body things it needs rather than what it wants, like milkshakes. Their ingredients are all natural and locally sourced. They prefer to work with local farmers and build meaningful relationships not only with them, but also with their customers. Everything is juiced on site. This shot is called the Cold Busta. It has lemon, ginger, garlic, jalapeño, beet, tumeric, oreganol and cayenne. It was INTENSE! I had no idea what was happening inside my mouth but I liked it, I think. It was totally invigorating. If you're tired of eating your vegetables, just put them in a blender with some fruit and call it a day. I don't particularly like juices so I always go straight for smoothies. Mainly because they remind me of milkshakes, and I always want milkshakes ((obviously)). It's nice that their categories are geared toward your needs. Fresh & Easy, High Protein, Superfood, and Top Shelf. The three pictured here are Fresh & Easy, which is exactly what they were. Light, refreshing, cold and full of nutrients. With over 20 smoothies and 7 juices to choose from, you're likely to find at least one you will enjoy. I've personally never done a juice cleanse other than the all-to-general Lemon Juice Cayenne concontion everyone did a few years ago and it lasted about two days. Hashtag hangry. 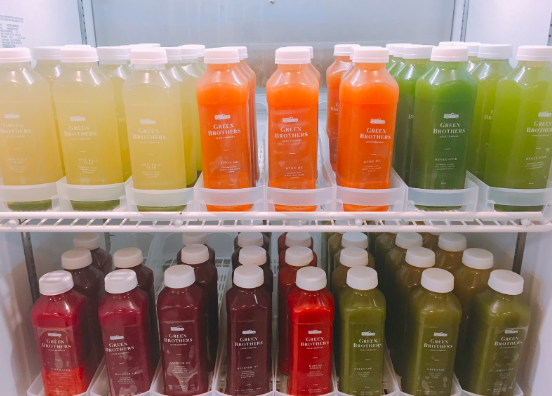 Seeing places like Juice Bar, Luna's Living Kitchen, and Viva Raw offering cleanse packages makes it way more appealing than trying to juice a million lemons by myself. And there must be some kind of benefit right? I asked Josh to sell me on why I should do a juice cleanse. Here goes: it gives your digestive track a rest and fights inflammation. It can have some potential weight loss benefits, it will give your skin a healthy glow, and will generate an energy boost in your metabolism. These all seem like things I would like, so, I might be down for trying one. Green Brothers Juice are currently located in the Bank of America Plaza, Duke Energy Center, and Dilworth. They are looking for a spot in Dilworth as their third location within the year. They will be offering a bottling service in the new kitchen so you can refill your glass jars any time you'd like!